WITH the surrender of Pakistani troops on December 16, 1971, in Dhaka, Bangladesh came into being, and with that, the end of the Pakistan that Quaid-i-Azam Mohammad Ali Jinnah had originally created. It also resulted in the end of 13 years of military rule in what remained of the country. Zulfikar Ali Bhutto, who was in New York at the time, flew in to Rawalpindi on December 20, and, with the assistance of a group of the military’s general officers who had been dismayed by Gen Yahya Khan and his core group over the defeat, forcing Yahya out, became the president of Pakistan as well as its only civilian Chief Martial Law Administrator. Within a matter of days, Bhutto began to put into effect his mandate of the people, based on his electoral manifesto which had won him a majority in the elections in West Pakistan a year earlier. While economic and social reform was a key plank of the Bhutto promise, what needed pressing attention, among numerous things, was the return of the 93,000, mostly military, prisoners of war (POWs) in India. In 1971, Pakistan had lost not just East Pakistan, but half its navy, one-third of its army, and a quarter of its air force. India occupied 5,000 square miles of West Pakistani territory. The military stood humiliated after the surrender, and this was the first of only two opportunities (the other was in 2008) when elected leaders could have established long-lasting democratic rule in Pakistan. 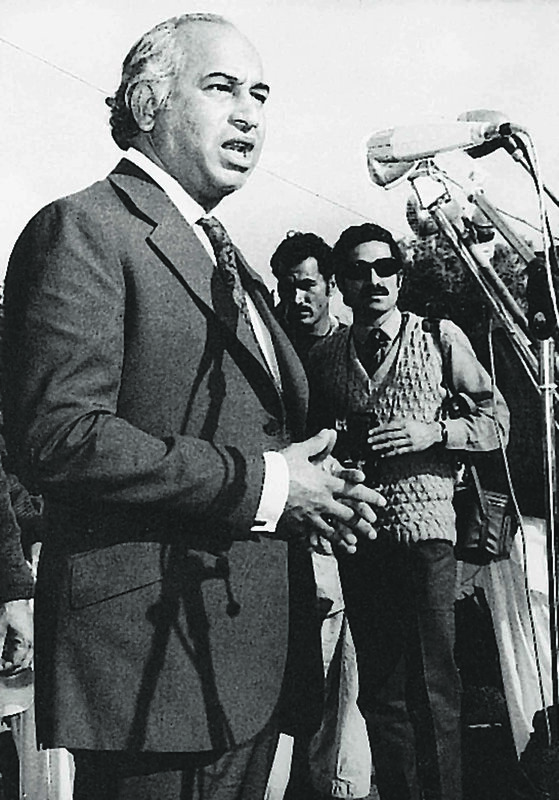 Bhutto even initiated a judicial commission, under chief justice Hamoodur Rahman, “to prepare a full and complete account of the circumstances surrounding the atrocities and 1971 war”, including the “circumstances in which the Commander of the Eastern Military Command surrendered the Eastern contingent forces under his command who laid down their arms”. 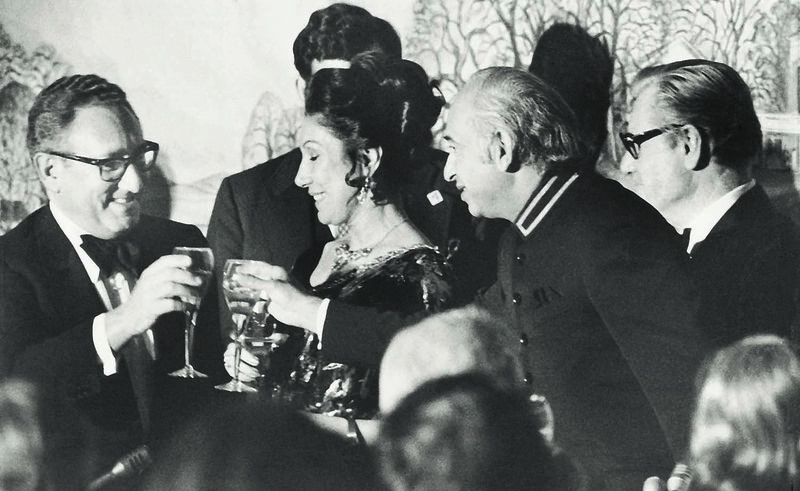 Bhutto outdid himself when he met Indira Gandhi at Simla in July 1972 and got the better of her through his persuasive negotiating skills, and secured the release of Pakistani POWs (who came home in 1974), with India returning Pakistan’s territory, and both countries accepting the ceasefire line in Kashmir as the Line of Control. Bhutto returned a hero, yet again, to Pakistan, not just for the people, but also for sections of the military. On a parallel track, Bhutto’s leftist economic team was implementing promises that had been made during the election campaign of 1970. With roti, kapra aur makaan the key slogans of Bhutto’s electoral commitment of his notion of Islamic Socialism and social justice, the manifesto of his Pakistan People’s Party had promised the nationalisation of all basic industries and financial institutions. It had stated that “those means of production that are the generators of industrial advance or on which depend other industries must not be allowed to be vested in private hands; secondly, that all enterprises that constitute the infrastructure of the national economy must be in public ownership; thirdly, that institutions dealing with the medium of exchange, that is banking and insurance, must be nationalised”. The economic policies of the Bhutto government rested on the premise that the control of the leading enterprises was to be in the hands of the state. It ought to be pointed out that while this policy of nationalisation has been much maligned by critics of Bhutto, his policies were a reflection of the times and of the age in which they were implemented. Since Bhutto’s rise to electoral success was based on his populist critique of Ayub Khan’s economic policies of functional inequality resulting in the infamous ‘22 families’, issues of redistribution, nationalisation and social-sector development were fundamental to his economic programme. Literally within days of taking over power, in January 1972, Bhutto had nationalised 30 major firms in 10 key industries in the large-scale manufacturing sector, essentially in the capital and intermediate goods industry. In March 1972, his government had nationalised insurance companies, and banks were to follow in 1974, as were other industrial concerns in 1976. In addition to nationalisation, extensive labour reforms were also initiated by the Bhutto government, giving labour far greater rights than they had had in the past. With the need to break the industrial-financial nexus a pillar of Bhutto’s populist social agenda, in a country which at that time was predominantly rural and agricultural, the ownership of land determined economic, social and political power. Bhutto had promised to break the hold of the feudals (notwithstanding the fact that he himself owned much land) and undertook extensive land reforms in March 1972. In a speech, he said his land reforms would “effectively break up the iniquitous concentrations of landed wealth, reduce income disparities, increase production, reduce unemployment, streamline the administration of land revenue and agricultural taxation, and truly lay down the foundations of a relationship of honour and mutual benefit between the landowner and tenant”. The PPP manifesto laid the premise for this action by stating that “the breakup of the large estates to destroy the feudal landowners is a national necessity that will have to be carried through by practical measures”. The government had decided that the land resumed from landowners would not receive any compensation unlike the Ayub Khan reforms of 1959, and this land was to be distributed free to landless tenants. The ceilings for owning land were also cut from 500 acres of irrigated land to 150 acres in 1972. Although a lot of propaganda was churned out about the success of the 1972 reforms, the resumed land was far less than was the case in 1959, and only one per cent of the landless tenants and small owners benefited from these measures. Nevertheless, like labour reforms, tenancy reforms for agricultural workers and for landless labour did give those cultivating land far greater usufruct and legal rights to the land than they previously had. Along with these structural interventions in the economy which changed ownership patterns and property rights, an ambitious social-sector programme, consisting, among other things, of the nationalisation of schools and initiating a people’s health scheme providing free healthcare to all, was also initiated. However, while economic and social reform was a key plank of the Bhutto promise and his energies were also consumed by the process of getting the POWs released, giving Pakistan its first democratic constitution was also high on his agenda. Although 125 of the 135 members of the National Assembly voted for Pakistan’s Constitution on April 10, 1973, Zulfikar Ali Bhutto is given, and deservedly so, credit for making a large, discordant group of nationalists and Islamists to agree to the draft. 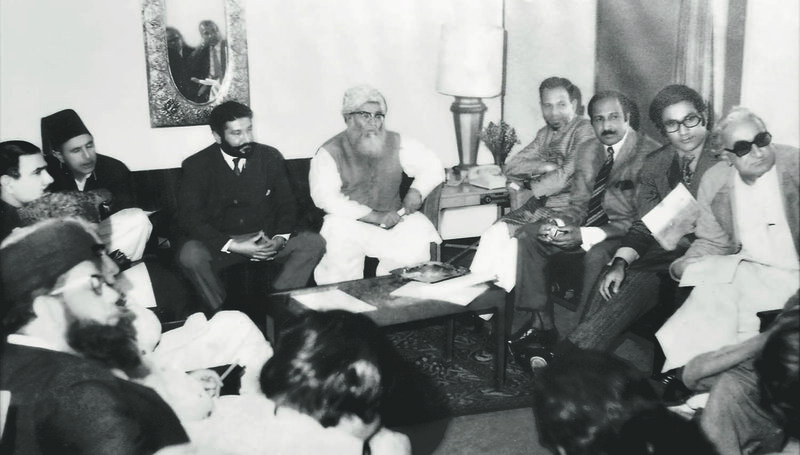 To get leaders like Wali Khan, who was the parliamentary leader of the opposition, Mir Ghaus Baksh Bizenjo, the sardars of Balochistan, Mufti Mahmud, and Mian Tufail, who had replaced Maulana Maudoodi as the Jamaat-e-Islami Amir, to build a consensus on a document that would determine Pakistan’s democratic trajectory was a major feat. The Constitution came into effect on August 14, 1973, setting out a parliamentary form of government, with Bhutto as Pakistan’s first democratically elected prime minister. Since Bhutto ruled the Punjab and Sindh, he had made concessions to the nationalists in order to make them agree to his terms. Ayesha Jalal quotes Bhutto as saying that while Wali Khan “vehemently opposed” the Constitution, he skilfully manoeuvred the Khan and “smashed him into becoming a Pakistani”. 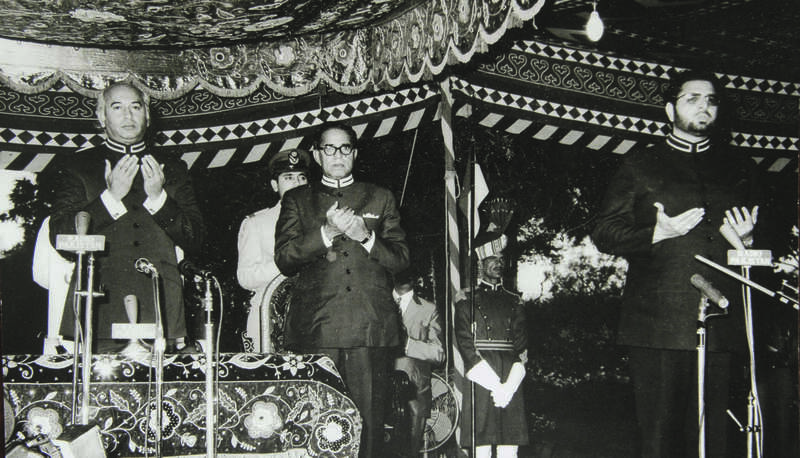 A key clause in the 1973 Constitution required members of the armed forces to take an oath promising not to take part in political activities and making it illegal for the military to intervene in politics. Clearly, the military did not read or care for the Constitution either in 1977 or in 1999. While the PPP had its governments in the Punjab and Sindh, the North West Frontier Province (NWFP) and Balochistan were ruled by coalition governments formed by the National Awami Party (NAP) and the Jamiat-e-Ulema Islam (JUI) which gave a voice to Baloch and Pashtun nationalisms of the 1970s variety. In February 1973, weapons were found in the Iraqi embassy in Islamabad that were supposedly meant for armed insurrection by the nationalists in Balochistan. On February 14, Sardar Attaullah Khan Mengal’s government in Balochistan was dismissed, and the next day, the NAP-JUI government in the NWFP resigned, while Bhutto’s governor in Balochistan, Sardar Akbar Khan Bugti, resigned in October 1973 as a political crisis emerged and grew stronger by the day. Many of the sardars and their tribesmen had started a militant movement for a Greater Balochistan, joined in by many Cambridge-educated scions of elite households, largely from the Punjab. Bhutto called in the military, with General Tikka Khan, dubbed by many as the ‘butcher of East Pakistan’, to curb the armed uprising and for Tikka Khan to add another accolade to his titles, that of the ‘butcher of Balochistan’. So soon after having lost political and public support, once again, a constitutional crisis slowly brought in the military into a position of increasing prestige and prominence. The lessons of just a few years ago, of giving nationalists their rights and accepting electoral outcomes, were once again being brushed aside by the same democratically-elected leader, and, indeed, by the military. As his rule progressed, we see clear signs of hubris and authoritarianism emerging in the political practices of Bhutto, but there were early signs which may have suggested what was to come, with Shuja Nawaz and many other authors seeing the rise of an eventual “civilian dictatorship”. One example of this was the decision to set up the Federal Security Force (FSF), a paramilitary organisation, so as not to rely on the military, as early as September 1972. The FSF, whose head later became a state witness in the infamous Bhutto trial, was once seen as ‘Bhutto’s private military arm’. Furthermore, it is ironic that while Bhutto was a social democrat, giving numerous rights and powers to the downtrodden, to the labourers and to the peasants and landless workers, he also used the power of the state to undermine the force of the street, particularly in Karachi. In the summer of 1972, organised trade unions in Karachi took to the streets and initiated industrial action in the form of strikes, but were met by a brutal police force resulting in the death of a number of workers. Organised labour, which had supported Bhutto’s rise, was dealt a harsh blow about the reality of incumbent politics. Prime Minister Zulfikar Ali Bhutto was as comfortable, if not more, in the company of foreign dignitaries as he was with the masses at home. He is seen here in Washington DC with United States Secretary of State Henry Kissinger (left) during a visit in February 1975. 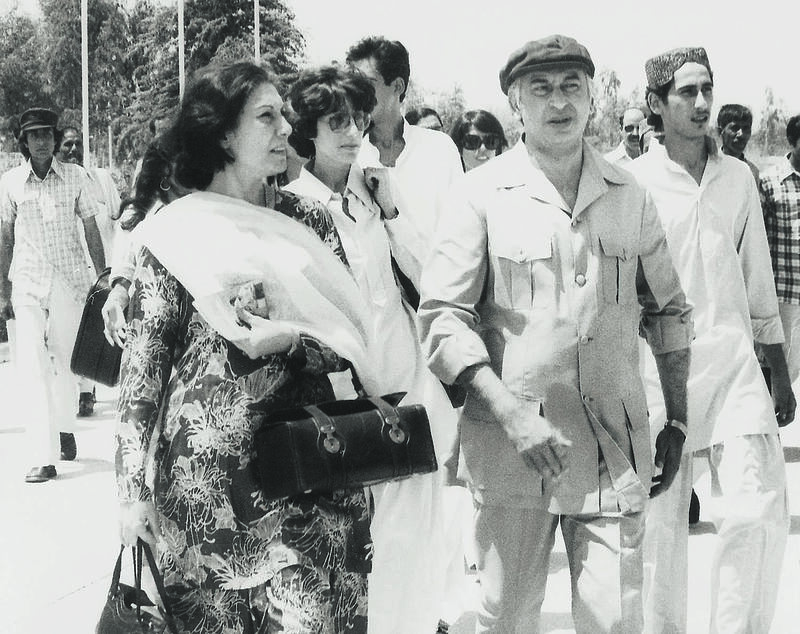 Seen in the middle is Begum Nusrat Bhutto. Like Jinnah, the Quaid-e-Azam, before him, 24 years later, Bhutto, the Quaid-e-Awam, was building a new country. Both had dismissed provincial governments and showed signs of an incipient authoritarianism and desire for centralisation and control. We do not know what Jinnah would have done had he lived, but Bhutto’s democratic and socialist credentials were soon to come undone. Arrogance and clear signs of intolerance of dissent were emerging in the Pakistan of 1972-73. Many of the promises made in the late 1960s and the early 1970s by Bhutto were to be played out between 1974 and 1977, setting a stage for Bhutto’s regional and global aspirations and ambitions. However, perhaps it was the same ambition and confidence that had led him to an electoral victory in 1970 which was to become a cause for his eventual downfall in 1977, and then death in 1979. He had also made far too many enemies along the way, and many of them were just waiting for their opportunity to settle scores. Between 1974 and 1977, Bhutto was to give them many such opportunities.